Music festivals are among the few events in human history that have managed, successfully, to gather people of every race, origin, social background, in one place under the concepts of unity and brotherhood. Ephemeral places where diversity is not demonized, flattened it in any way, but exalted and held together by the common passion for music. 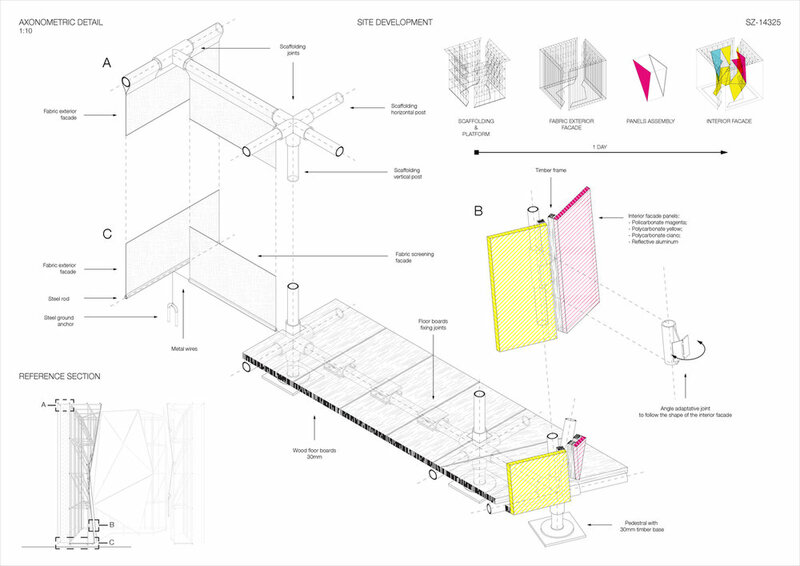 The project is born from this consideration and tries to concentrate the spirit of the festival into a single object. The design presents itself in the pure form of a platonic solid acting as an iconic landmark and lantern for the festival. The visitors will easily recognise it from distance and be able to orientate themselves around the festival during day and night. The pure form conceived by the external layers of veil that wrap around the structure hide a much more intricate and irrational volume yet to discover by the visitor. This last one will initially be attracted by the glowing aura of the object, to then start perceiving the existence of an inner element. As the visitor approaches the object, the initial visual connection now becomes physical as he stands in front of the platonic solid. 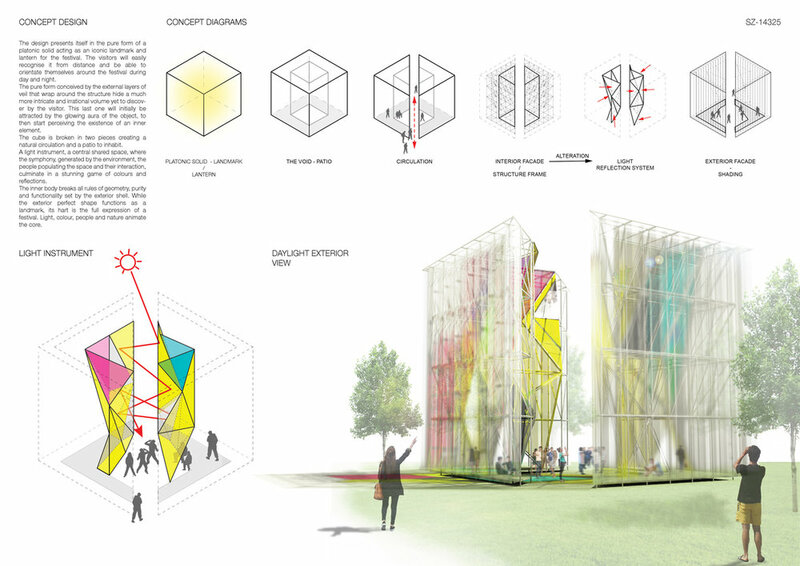 The cube is broken in two pieces creating a natural circulation and a patio to inhabit. A light instrument, a central shared space, where the symphony, generated by the environment, the people populating the space and their interaction, culminate in a stunning game of colours and reflections. The inner body breaks all rules of geometry, purity and functionality set by the exterior shell. While the exterior perfect shape functions as a landmark, its hart is the full expression of a festival. Light, colour, people and nature animate the core. The shape of the interior envelope is dictated by the movement of the sun, creating an irregular form. Polycarbonate panels in three primary colours (magenta, yellow and blue) and aluminium mirrored panels are used to create a spectacular and whimsical display of lights and colours, solely orchestrated/dictated by the relationship between the natural sunlight and the interaction of the people. As the sun follows its natural cycle, from rise to set, it will reflect different surfaces creating different atmospheres within the same space. 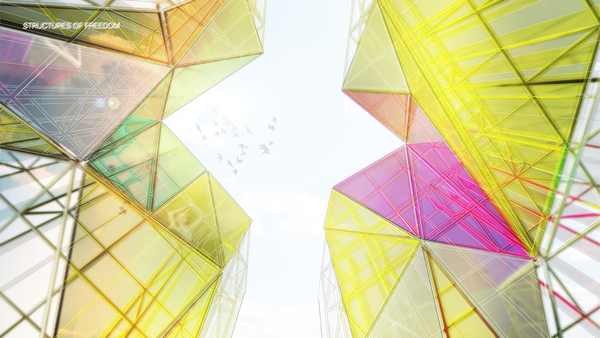 Our project is the perfect place to connect and socialize by recreating a festival within the festival but also a place to relax and get away from the crowd by simply sitting or lying down and enjoy the manifestation of light colours and reflections. 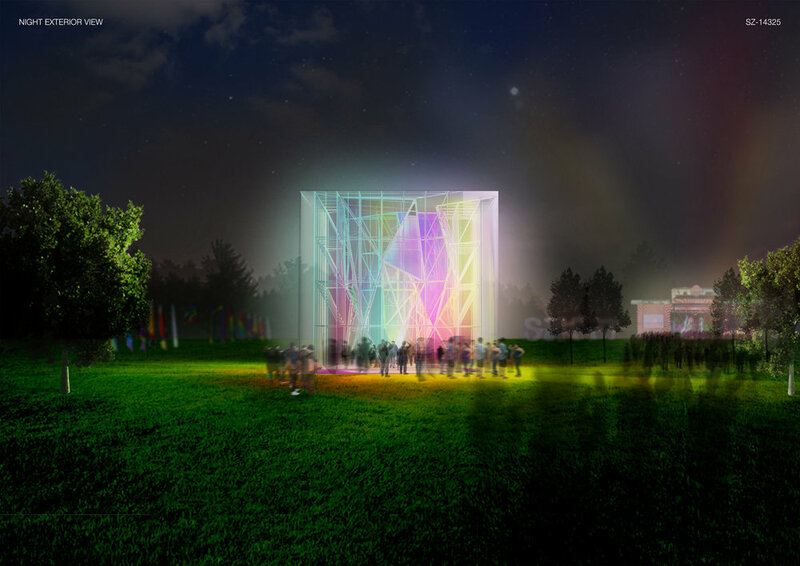 During the night the cube will reveal itself as a huge iconic lantern animated by artificial light, which will illuminate the internal and external façade recreating striking colour effects.